The Chinese believe that every meal should contain an equal division between fan, grains and starches, and t'sai, fruits, and vegetables. One of the grains they rely on to provide this harmonious dietary balance is noodles. Whether you slurp them, gulp them down, or twirl them on your fork, everyone seems to love noodles. Nearly all cultures have at least one cherished noodle dish, from German Spaetzle (homemade noodles with egg), to Jewish Kreplachs - noodle pastries filled with beef, chicken, and spices. But only the Italians rival China for the title of the culture most devoted to noodles. There is some dispute over who originally came up with the idea of mixing water and flour to create noodles. The Arabs claim to have been the first to use dried pasta, as a means of preserving flour during their forays across the desert. But regardless of their origin, we do know that the Chinese have been feasting on noodles for approximately 2000 years since the Han dynasty (206 BC - 220 AD). In fact, some experts believe that the Italians got their first taste of pasta when Marco Polo returned home from his long trek across China with a host of exotic food items, including noodles. Like Italian pasta, Asian noodles vary in width - they can be thick as coffee stir sticks or thin as toothpicks. When it comes to length, however, they are usually served long and uncut. This is because long noodles symbolize a long life in Chinese tradition. Noodles are commonly served at birthday celebrations, and fresh noodles are regularly placed at gravesites. Chinese noodles, known collectively as mien, fall into three main categories. The most common are wheat flour noodles, which can be made with or without eggs. While today wheat flour noodles are enjoyed throughout China, they originated in the north, where wheat is a staple crop. Depending on the remaining ingredients, wheat noodles can be white or yellow, thin as spaghetti or thick as fettucine, stiff or extremely elastic. 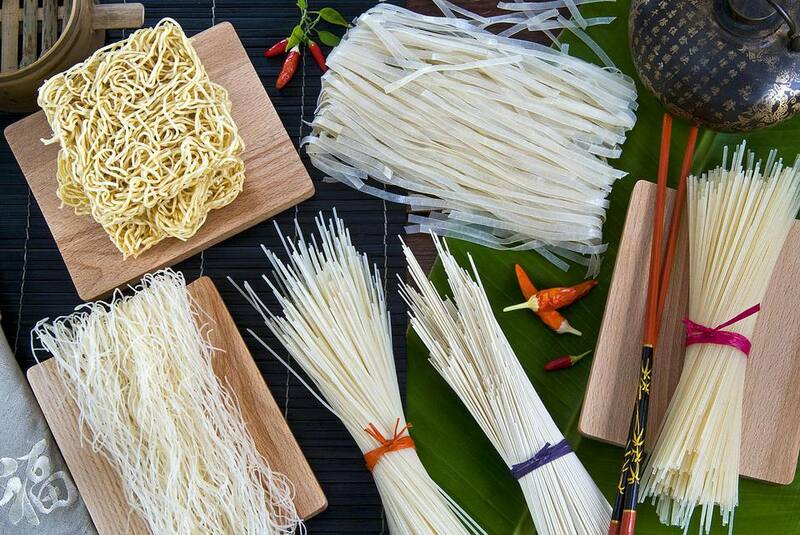 Made from rice flour, water, and salt, rice noodles can also be thick or very thin, the latter almost resembling long strings of coconut. The same is true of rice sticks. There are also rice paper wrappers which come in either circular or triangular shape. Finally, cellophane noodles are clear noodles made from ground mung bean paste. Noodles are eaten hot or cold, steamed, stir-fried, deep-fried, boiled, or served in a soup. For the nutritionally-inclined, noodles are an excellent source of protein. Besides being low in calories, they are extremely high in complex carbohydrates. Readers often ask me to explain the difference between lo mein and chow mein noodles. Actually, the difference between the two lies not in the type of noodles used, but in the way the two dishes are prepared. In the case of chow mein, the ingredients are stir-fried and then served over noodles that have been prepared separately. By contrast, lo mein involves tossing boiled noodles in the wok and mixing them with other ingredients during the final stages of cooking. This allows the noodles to pick up more of the sauce flavor. Cellophane Noodles - Also called bean threads, slippery noodles, or even bean vermicelli, cellophane noodles are made from mung bean starch. Before using, soak them in hot (not boiling) water. Cellophane noodles work well in soups and stir-fries, absorbing the flavor of the foods they are cooked with. When deep-fried fried they puff up and become quite crispy. Egg Flour Noodles - Fresh or dried, you'll usually know these noodles by their yellow color. Made with eggs, wheat flour, and water, they come in a number of widths and shapes, from the thinner vermicelli to flat thicker noodles (Instant Ramen noodles are a type of egg flour noodle). Used in soups and stir-fries, they need to be boiled before using.